I’ve been working for this amazing pizza company in the central northlands of Vermont, for the past few years -- many of you know us at Woodbelly for our delicious, thin crust, wood-fired pizza. We cater weddings and parties, sell our pizza to hungry market goers, and drive big trucks with pizza ovens trailing behind them. Born and raised on our friends’ farm up north, last year we survived our first season as a local catering company based out of the capitol and made it through the sometimes nightmarish logistics of small businesshood in beauty and love (as often as humanly possible); We made each other tea, asked and answered hard questions of one another, and ultimately worked our asses off. As most things go up north, our season winds down as the winds pick up. Glorious, impossible winter sets in and I usually scoot to other parts of the world living a semi-nomadic and incredibly fulfilling life balancing work and play. This past fall, I set my sights westward weaving my way through the import stores, queer dance clubs, Kabuki spas and city parks of San Francisco. 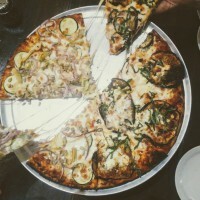 During a phone conversation with my sister, Mollie (who also works with Woodbelly), I jokingly mentioned I would go a pizza tour while out west -- and now, this article springs forth from that phone call months ago. When you walk into most shops and chat ‘em up a bit only to mention that you make pizza for a living, they look at you kind of strange and then make you the most beautiful pizza they can muster! So, what started off as a benign and playful hustle for better service became a sort of focus - a guiding force throughout my time here in the city. For a little over a week, I ate as much pizza in as many different environments and styles as my companions and my belly would tolerate. Now, I’m not here to write about the shops’ names and menus or act as some sort of review writer. You can go online and find hundreds of pizza maker reviews in San Francisco and as it is, there are too many “top-100 best eats” to count. I won't write to you that way because I don't fancy myself a food critic; I am a vegetable farmer - a sheep herding, trailer driving, mountain climbing, lake swimming, pizza-slingin’ wild one from the north - I am in love with the vast colors and flavors of this world. I’ve spent most of my life trying to find meaning in work; trying to find beauty and love in surviving. Seeking the connections between where I end and the world begins. Of course, in my travels and explorations, I often forget to eat. My regulatory systems go whacky and I wait until the last possible moment before blood-sugar-shut-down to find the most reputable, interesting, authentic ‘lil place close by. In times like these, I realize how often I crave pizza - that ancient perfection! Nourishing (usually), balanced (sometimes) and easy to carry with ya. What did I find? San Francisco is full of varying, beautiful styles and hard-working, food-loving people. It is also full of arbitrary, aesthetic hierarchies. I was downright disappointed in the quality of a few of the “fancier” places… I mean, surprisingly disappointed. The quality and flavor of food does not magically coincide with aesthetics or prices. Fancy does not equal mastery. I guess the pizza world is subject to the same maladies as any other artform of our time. I want to pay more for fresh ingredients; for balanced flavor palates; for the transformed perfection of fresh, sweet, nutty breadstuffs! I want to pay more for a story, a connection, an authentic reason why that business should exist. It is painful to pay an arm and a leg for downright awful pizza eaten by schmoozy candlelight. When it comes down to it, it's all about fresh ingredients, folks. Fresh ingredients. You can’t take the simplicity and beauty of PIZZA and slap some tin-canny-flavored sauce and soggy, sad veggies on top and expect it to please, pop, or nourish. I mean, even bad pizza is actually really good most of the time. But genuinely good pizza can be something else. Have you ever been blown away by the way flavors hit, layer, and round out in every bite? The balanced sweetness, the subtle roundness that sour can provide, the all-pervasive and opening way of salt?! Now I’m not sure if any pizza has carried all six tastes of the Ayurvedic tradition but… perhaps, that’s something we can try this coming season. When it comes to crust, I want sourdough. Hands down. It makes it for me. Sourdough is an art. Sourdough carries the soul of tired, strong hands. It carries the soul of life-tending. It is also much easier for most bodies to digest. In my time at Woodbelly, we’ve had folks who struggle with the over-gluten-endowed culture eat and digest our pizza no problem. I am partial to a pizza cooked in a wood-fired oven. What could be better than a living, resting dough with balanced, fresh flavors atop, thrown into a blazing wood fire?! Ai yai yai. It is here that ferment and fresh meets fire. The wood-fired oven does the crust justice by bringing out the deep flavor of the grains and ferments. For us, fire also makes the art of cooking much more interesting. It’s funny because I’m so obviously biased… but also, these are the reasons why I am continually a part of Woodbelly projects. I think we do it right. In the end, I wanted to know each place I visited by their specialties, their quirks, their shortcomings; I wanted to wrap it all up in my heart as a present to the people that I love and work with; I wanted to bring home new ideas, enrich our experience and bring some perspective (much needed in Vermont with the glorious seclusion of our northern agricultural pocket), into what we’re doing with our work.